History of the OHG. 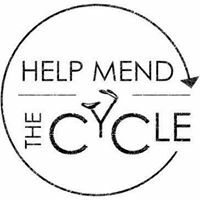 | PortBUG: The Port Adelaide Bicycle User Group. Origins: Establishing a long distance, ‘low stress’ City-to-Port Bicycle Route – away from arterial roads & linked to the Outer Harbour rail corridor and local bike networks – has long been on the agenda of the Port Adelaide Bicycle User Group. 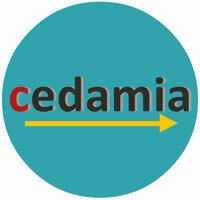 Our focus really started to come together with a way-finding ‘saddle survey’ we undertook in August 2005. We then put together an illustrated proposal for a Port-City Green Travel Corridor or ‘The GreenLink’. This was provided to the PA/E Council & to Patrick Conlon, the Transport Minister of the day in the Rain Labour Government. This booklet identified the route’s potential as well as some of the specific challenges involved. 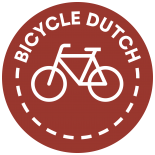 In cooperation with the Bicycle Institute of S.A. we recommended that the GreenLink route development be incorporated into an overall Adelaide Greenway Network plan. 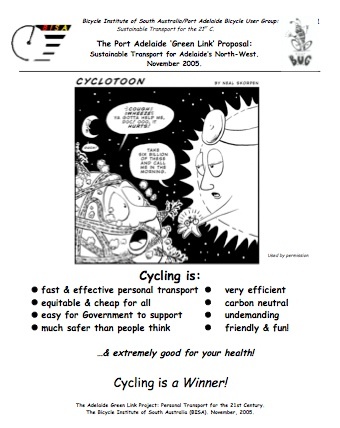 An initial Network Plan was then published in SA’s 2006 ‘Safety in Numbers’ bicycle strategy (2006-10). PortBUG’s GreenLink proposal was also adopted as a major focus for the Port Adelaide/Enfield Council’s first Local Area Strategic Bicycle Plan (2008-12). Labour State Transport Minister Pat Conlon was particularly interested in cycling & had his own vision for a Greenway Network across Adelaide. In 2010 the S.A Labour Party published a ‘Greenways and Cycle Paths Policy’ to stimulate local government agendas. A more detailed vision for Adelaide’s Greenway Network subsequently appeared in SA’s ’30 Year Plan for Greater Adelaide’, also linked to the Government’s sustainable transport, housing, health & economic development policies. assist further refinement over time. Premier Rann announces Greenway Project funding. 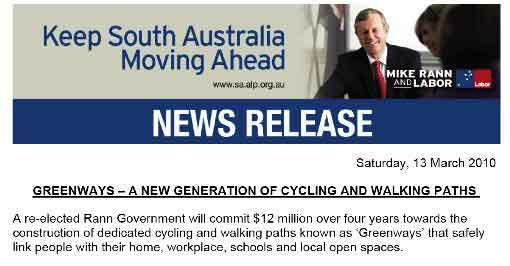 Funding: In 2010 Premier Rann announced a four year funding package of $12M for the city-wide Greenway Project (2010-13) with initial work focussing on Greenways to the south of the CBD & to Glenelg. In late 2012 the Dep’t for Planning, Transport & Infrastructure informed the BUG that the Outer Harbour Greenway would be ‘next on the list’ and indeed, its development started to take shape over 2013. Development has largely been driven by the State Government’s transport department (DPTI) with responsibility gradually devolving to the two Councils initially involved (City of Charles Sturt and Port Adelaide/Enfield). Additional funding has subsequently also been provided as part of major projects at St Clair, Croydon (‘Torrens2Torrens’) and Bowden (‘Torrens Junction’). consistent advisory & destination signage along the route. Rebuilding and resurfacing of existing pathways has occurred at several points including Alberton & Rosewater. Some ‘bike friendly’ active rail crossings have been installed – these will facilitate bike access to the Greenway & also improve crossing safety for people using mobility devices & wheelchairs). Significant Greenway access has also been provided by the Renewal SA’s new ‘Harbour Loop’ pathway around the Port’s Inner Harbour & across the Birkenhead Bridge and by complementary pathways provided by PA/E Council along Semaphore Road. The Greenway North of ‘The Port’: In early 2017 additional works completed most of the Northern sections of the Outer Harbour Greenway (linking The Port to Outer Harbour) by providing off-road bike path linkages and signs to link local roads. New road crossings and signed Greenway links have also been provided through the waterfront precincts in the Port. New Bicycle Overpass at South Road. A New Overpass at South Road: At the City end of the OH Greenway the Torrens-to-Torrens project at South Road has provided a bikeway overpass and extended ramp way that extends to Coglin Street. This will eventually (sometime in 2019) extend all the way to East Street. This overpass has been a major step in the completion of the Greenway as a continuous and effective cycling route. Linking to the Park Lands: Between East Street and the Adelaide Parklands a new on & off-road bikeway passes along Drayton St, through the Bowden Rail Station precinct and then under Park Terrace to emerge in the Adelaide Parklands where cyclists can join the Parklands bike network. Completion: The last remaining section (about 150 metres of pathway to connect the Chief Street Bridge and East Street) will be completed sometime in 2019 as part of new housing developments on the Gasworks ‘Retort House’ heritage site. 2 Responses to History of the OHG. Is there a map of the greenway anywhere? Note that for some reason the map on page 8 doesn’t show the Grange section of the Greenway! & the maps pages 5 – 13.
http://www.dplg.sa.gov.au/plan4adelaide/html/files/plan/07c_Chapter_D.pdf Page 9 in particular! As soon as we get further information we’ll update the web page.